Some consider crispy to be the only true test of cooked chips. But slap chips also have their place. Clarke’s Bar & Dining Room. Chef-owner Lyndall Maunder says good fries look different: ‘They’re perky and hold their shape.’ Clarke’s chips are double-cooked: blanched in oil initially, then fried to order in very hot oil. Potatoes, skins on, are sliced in a machine operated by hand, on site. Order magnificent fries on the side (R10) or regular fries with homemade aioli (R40). Cheese fries (R55) are practically a meal: a basket of crispy fries under tomato ragu, with homemade ‘Melrose-like’ gooey sauce that imitates America’s cheese whizz concept, finished under the grill. Bree Street, Cape Town. 021-424-7648. 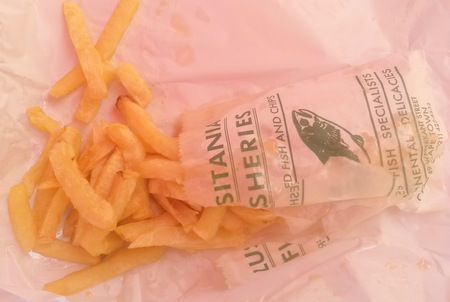 Lusitania Fisheries. Some consider crispy to be the only true chip test. But slap chips have their place, indicated by queues inside this second-generation family business. Potatoes are put through a machine slicer here daily, and fried once in clean oil, creating properly cooked, no-frills slap chips (R15 to R65 for extra large). Request extra vinegar and salt before they’re paper-wrapped. Waterkant Street, Cape Town. 021-425-4532. Mondiall Burger Bar. Most people go for their burgers, but R28 French fries doused with truffle oil and grated Parmesan are worthy of a special visit. Sold from Mondiall’s take-away hatch, potatoes are machine-sliced on site. 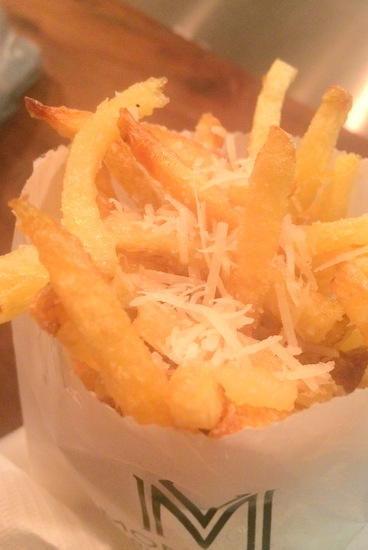 Like their truffle counterparts, plain skinny fries (R20) are crispy, thin and double-fried. Alfred Mall, V&A Waterfront. Tel 021-418-3003. Societi Bistro. I love it when chefs talk potato. ‘We go for the Van der Plank variety if we can,’ says Stephan Marais. ‘Ours are fatter, peeled fries, cut by hand so they’re not uniform.’ Double-fried until crisp, a R20 side order includes homemade mayonnaise. Orange Street, Cape Town. 021-424-2100. Find these also at The Brasserie, Tokai. The Company’s Garden Restaurant. Perfect, rustic chips: order as a menu side order, or devour a bowl for R30. Starchy Avalanche potatoes are machine-sliced here; skins stay on. ‘We cook for three or four minutes to set the outside. The second time briefly at higher temperatures, so the inside gets crispy and golden,’ says chef Jody Carolus. Queen Victoria Street, Cape Town. 021-423-2919. Find these also at Café Manhattan, Sidewalk Café and Café Mozart. Late addition: Bertus Basson at Spice Route. This missed the print deadline, but I have it on good authority that the chips served at this Paarl Winelands restaurant are worth a special mention. Twice-cooked, freshly cut with skins on, dusted with braai spice and Parmesan. A version of this appeared in The Times on 25 March 2015.